A number of outstanding authorities have proven the therapeutic advantages of using cider vinegar for numerous complaints ranging from obesity and overweight to arthritis. Besides the therapeutic benefits derived from taking cider vinegar therapy, it can also be used for a number of other purposes e.g. 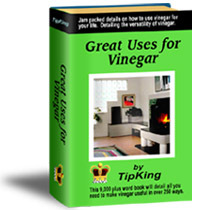 salad dressing, pickling, a flavour in cooking etc. It also makes a very refreshing drink, hot or cold, with or without honey - this should take the place of normal tea and coffee which are so habit-forming and unnecessary commodities.